Dr. Tran BioSci Consulting: The 'Real Story' Behind Orexigen Therapeutics, Inc. The 'Real Story' Behind Orexigen Therapeutics, Inc.
Editor's notes: I published a short thesis on Orexigen on Dec. 24, 2013, to warn investors of the market hype/manipulation. The article was met with strong criticism. Needless to say, those that heeded my warnings would save themselves from losing more than 95% of their invested capital. Those who shorted this whisper-stock would have enjoyed a 95% gain. Truth be told, I have not shorted any stocks in years. According to Warren Buffett's mentor, Benjamin Graham, when shorting stocks one must have convincing evidence. In this research, I wanted to release the overwhelming evidence proving that Orexigen Therapeutics, Inc. (NASDAQ:OREX) is fundamentally unsound. Moreover, while the FDA approval decision for Contrave is still "up to the jury," Orexigen would surely face the insurmountable problem of dismal sales for Contrave should the drug ever gain marketing approval. Contrary to the prevailing notion of the market, I strongly believe that the future for Orexigen is full of calamities. Consequently, investing in this "whisper stock" would only result in imminent financial catastrophe for investors and speculators alike. According to the data from the U.S. Surgeon General, 61% of the U.S. population is either overweight or obese as of 1999. Similar data from the Center For Disease Control And Prevention (CDC) showed that this 61% prevalence climbed to nearly 70% in 2010. In this research, the terminology of obesity and overweight are used interchangeably. However, obesity and overweight are diagnostically different from each other based on a patient's body mass index (BMI). Physicians calculate a patient's BMI by dividing weight (kg) by height (m2). Accordingly, patients who are overweight are said to have BMI within the range of 25 to 29.9 kg/m2. Having a BMI ≥30 kg/m2 or a BMI ≥ 40 kg/m2 would place the patient in the obese or severely obese diagnostic categories. Obesity is detrimental to a patient's health in various ways. For instance, it increases a patient's risk for having high blood pressure, diabetes, heart diseases and certain forms of cancer. Moreover, it subjects a patient to having increased risks for discrimination and low self-esteem. When I was an obesity researcher at Columbia, I learned that there was no target in our brain that could be manipulated for safe weight reduction. However, the Wall Street financiers were overly optimistic and they believed that Orexigen was on the verge of discovering a "silver bullet" for obesity. Orexigen is a small biopharmaceutical company based in La Jolla, Calif., trying to develop an anti-obesity drug called Contrave. The drug is by far anything near revolutionary or novel. It is simply a combination of the sustained release version of two FDA approved generics: naltrexone and bupropion. Contrary to prevailing speculations of the FDA approval for Contrave, the Agency issued a complete response letter or a rejection letter (CRL) to Orexigen on January 2011. Consequently, the stocks went into a free fall and resulted catastrophic financial loss for shareholders. Subsequent to the CRL aftermath, Orexigen met up with the FDA and ran the cardiovascular safety trial, dubbed the "Light" trial, as requested by the Agency. On Nov. 25, 2013, management held a conference call for shareholders and touted their robust interim results from this trial. However, they failed to disclose any specific results of the trial per se. This is analogous to the effort of trying to instigate another speculation run for the stocks. On Dec. 11, 2013, the company resubmitted their new drug application (NDA), and expected a response from the Agency sometime during Q2 FY 2014. Though the FDA approval process is never a guaranteed, CEO Michael Narachi voiced his confidence in the drug's approval -- the similar false optimism that resulted in the rejection letter in January 2011. SAN DIEGO, Dec. 11, 2013 /PRNewswire/ -- Orexigen Therapeutics, Inc. today announced that the company has resubmitted the Contrave New Drug Application to the United States (U.S.) Food and Drug Administration (FDA). Investigational drug Contrave (naltrexone sustained release SR / bupropion SR) is being developed for weight loss and maintenance of weight loss. The resubmission follows the Nov. 25, 2013, announcement of the successful interim analysis of the Light Study, the Contrave cardiovascular outcomes trial (CVOT), which is being conducted under a Special Protocol Assessment with the FDA. In January 2011, Orexigen received a Complete Response Letter from the FDA detailing a single approval deficiency-the need to conduct a clinical trial of sufficient size and duration to exclude excess risk of major adverse cardiovascular events. In less than three years, Orexigen negotiated with FDA a feasible CVOT design, enrolled the CVOT, and generated safety data responsive to the CRL. By agreement with the FDA, the independent Data Monitoring Committee's summary report of the Light Study interim analysis formed the basis of the resubmission of the NDA. The interim analysis clinical study report will be supplied to the FDA within 60 days of the NDA resubmission. The review period for the resubmission is expected to be six months. Whether Contrave or any other drugs could post meaningful sales ultimately depends on the physicians' willingness to write prescriptions for these drugs. Though different factors dictating the physicians' prescribing tendency, physicians rely heavily on using the following: a "benefits-to-risks" approach, evidence based medicine and (EBM) guidelines, and a drug's affordability. As significant concerns for shareholders, Contrave doesn't have a favorable benefits-to-risks profile nor is it cost-effective enough that it would necessitate its use. There's other evidence that goes against the likelihood of this drug's success. However, that is beyond the scope of this research. As noted above, Contrave is a combination of sustained release versions of two previously FDA approved drugs, including naltrexone and bupropion. Naltrexone is an opioid antagonist that has long acting properties and is used to treat opioid addiction. Bupropion is a psychiatric medication used to treat depression, but is sometimes prescribed for smoking cessation. Bupropion, as an SSRI (selective serotonin reuptake inhibitor), increases serotonergic activities in the brain. Serotonin regulates mood and wakefulness, and therefore is beneficial in depressed patients who have an "imbalance" of serotonin levels. Bupropion, however, can also have deadly unforeseen consequences in obese patients who do not have a low or "imbalanced" serotonin level per se. In addition, most doctors who prescribe these drugs are often primary care doctors (PCP) such as family physicians and internists, who are reluctant/uncomfortable with prescribing such psychiatric medications. Patients with major depressive disorder, both adult and pediatric, may experience worsening of their depression and/or the emergence of suicidal ideation and behavior or unusual changes in behavior, whether or not they are taking antidepressant medications, and this risk may persist until significant remission occurs. Suicide is a known risk of depression and certain other psychiatric disorders, and these disorders themselves are the strongest predictors of suicide. There has been a long-standing concern, however, that antidepressants may have a role in inducing worsening of depression and the emergence of suicidality in certain patients during the early phases of treatment. Pooled analyses of short-term placebo-controlled trials of antidepressant drugs (SSRIs and others) showed that these drugs increase the risk of suicidal thinking and behavior suicidality in children, adolescents, and young adults (ages 18-24) with major depressive disorder and other psychiatric disorders. Short-term studies did not show an increase in the risk of suicidality with antidepressants compared to placebo in adults beyond age 24; there was a reduction with antidepressants compared to placebo in adults aged 65 and older. Dose-related hepatocellular injury is possible; the margin of separation between the apparent safe and hepatotoxic doses appears to be ≤ fivefold. Discontinue therapy if signs/symptoms of acute hepatitis develop. Clinicians should note that elevated transaminases may be a result of pre-existing alcoholic liver disease, hepatitis B and/or C infection, or concomitant use of other hepatotoxic drugs; abrupt opioid withdrawal may also lead to acute liver injury. Naltrexone oral tablets are contraindicated in patients with acute hepatitis or liver failure; cautious use of intramuscular injection is recommended in severe hepatic impairment (due to coagulopathy). Let's face it, there are patients who are on the heavier side who want to shed extra pounds because they think they are going to "look good and feel great." Given the narrow margin between the safety level and hepatotoxic level, naltrexone may increase their risk of having liver damage if these patients take naltrexone and other hepatotoxic drugs like Tylenol or ibuprofen. Accidental opioid overdose: Patients who had been treated with naltrexone may respond to lower opioid doses than previously used. This could result in potentially life-threatening opioid intoxication. Patients should be aware that they might be more sensitive to lower doses of opioids after naltrexone treatment is discontinued, after a missed dose, or near the end of the dosing interval. Warn patients that any attempt to overcome opioid blockade during naltrexone therapy, could potentially lead to fatal opioid overdose; the opioid competitive receptor blockade produced by naltrexone is potentially surmountable in the presence of large amounts of opioids. So why did the FDA, an established U.S. agency, approve such a drug? It's all related to the risk vs. benefits. If a physician can prove a drug's benefit outweighs its risk, why not prescribe it. Patients who I prescribed bupropion were the ones who had serious psychiatric disorders in addition to substance abuse. There are many patients suffering from obesity -- obesity is a serious epidemic. However, I would pose the following question: "Is a weight reduction of slightly more than 5% worth the risks of putting patients at risk for such adverse effects?" I don't believe so. Let's just assume that there is no side effect whatsoever to this "miracle drug" -- does the miniscule percentage of weight reduction last? According to the literature, most weight-loss medications decrease their effect after two years and that could be due to a drug's tolerance. Whatever the cause is for these weight loss drugs to cease working doesn't matter, the fact that they lose their clinical benefits over the long run would deter a medical doctor from prescribing these drugs. As an MD, I can attest to this truth. Now, let's take this argument a step further and assume that Contrave is indeed the "magic pill" as it causes superior weight reduction comparing to any competitors. Does this mean a doctor would prescribe Contrave over other weight loss meds? In the best interest of the patient, the answer is no. The majority of physicians are considerate of the cost/affordability of a medication for their patients, because not all patients can afford certain brand name medications. Since Contrave is just a combination of two generic drugs, why not prescribed them separately to help cut down costs for patients and U.S. healthcare in general? This was the similar argument raised by Citron Research. 30 capsules of 7.5mg/46mg Qsymia cost $169.35. As demonstrated in the price comparison, OREX would have to sell Contrave (combinations of naltrexone 16mg or 32mg and bupropion 360mg) much cheaper than its peers and significantly below $110.36 in order to compete with generics naltrexone and bupropion. One may argue that there are no generics for 16mg or 32mg doses of bupropion. A patient can simply break the naltrexone 50mg into a 1/3 or 1/2 tablet. No matter how one looks at it, a brand name drug cannot compete with generics due to the significant price mismatch. It's understandable for a doctor to prescribe brand name medication when there's no generic available. Since there are generics naltrexone and bupropion, any medical doctor who is cost-conscious would not prescribe his or her patients a brand name medication like Contrave. Both generic and brand name prescriptions are bioequivalent and they have the same active pharmaceutical ingredients. Thus, it makes no clinical differences in preferring one drug to another. As proven, the deciding factor here is cost, and brand name prescriptions cannot compete with available generics from the perspective of pricing alone. Take Fusilvev, for instance, it used to generate more than $100 million in revenue for a small development-stage biotechnology like Spectrum Pharmaceutical (NASDAQ:SPPI). Fusilev is the biologically active enantiomer form, the L form, of leucovorin. In contrast, the generic version for Fusilev has both the L and D forms. During the leucovorin shortage back in 2009, the FDA approved Fusilev and it was a key revenue driver for Spectrum. There was much debate whether Fusilev would be able to maintain its niche once the leucovorin shortage is over. Not surprisingly, when the leucovorin shortage was over Fusilev sales bottomed out and the stock followed the same trajectory. The upper limit allowed for the dropped-out rate to a trial's validity is 20%. However, these drugs' trials data showed very high dropped out rates among participants (approximately 40% for CORI and about 46% for CORII and 40% for COR-BMOD). Thus, this fact is the smoking gun evidence that invalidated Orexigen's claim for Contrave's efficacy and safety. The high dropout rates signified that either the drug did not work and/or it had too many adverse effects. I found it not coincidental that management neither spoke about the limitation of these high dropout rates in the previous three trials nor this "Light" trial. 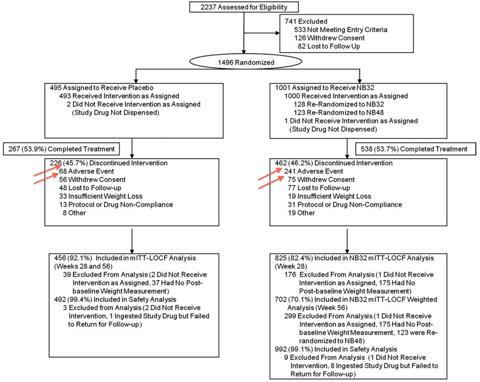 Instead, management chose to emphasize the overwhelming positive results of the "Light" trial and their "confidence" of an approval for Contrave. However, this is detrimental to the health of the public as well as the financial health of their shareholders. By solely focusing on the "positives" while downplaying or completely ignoring the negatives of the trial, management has breached their fiduciary duty and mislead their shareholders, the agency, and the general public. Given the horrendous rates of patients who dropped out of the trials, I questioned whether Contrave is safe at all. Now that the dead fish is starting to smell, I wouldn't be surprised if the FDA or other authorities are raising the same questions. And this development might not look favorable to the "jury." OREX's insiders are currently holding only 11.49% of the (87.10M) shares outstanding. 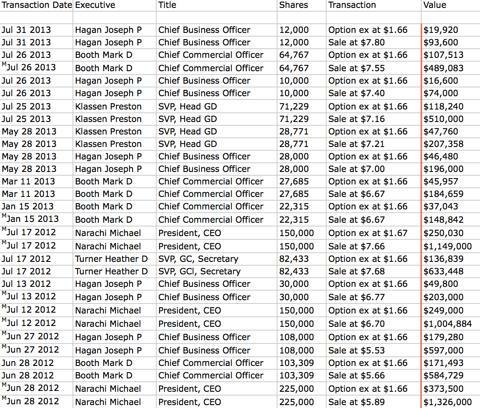 All of Orexigen's insider transactions for the period (June 29, 2012, to Aug. 2, 2013) were sales: "a net of $8,524,342." Why do you think that the management, owning only small percentages of shares outstanding in Orexigen, consistently exercised their stock options and sold their stocks out to the public? Whatever it was, it smelled "fishy" to me. It can be argued that these executives deserved a good bonus for what "great" the work that they have done for shareholders; moreover, they sold their stocks maybe for personal expenses only. If there were one or two insiders selling I would not have been concerned, but there were five different insiders selling during the past 1.5 years while no one was buying. I could only think of the following reasons why insiders sold "en mass": 1) they do not have faith in the products of the company, and 2) they are not aligning their own interests with those of shareholders. If management had believed that Contrave's chances for approval were good, why wouldn't they wait until the FDA approved Contrave so they could reap the capital appreciation resulting from Contrave's sales? Instead, they have been cashing out their shares. I find it difficult to believe that these executives could turn down "sure" money by investing in Contrave if they believe the drug is good. Let's examine a case regarding whether a director of Orexigen, Michael Powell, had faith in the company and Contrave per se. While speculations for the FDA approval for the drug were "boiling in the pot" (near the end of FY 2010) pushing OREX to an overvalued PPS of $9.45, Powel; sold $6,836,281 worth of stocks -- the largest figures transacted since May FY 2007. What did that action, one that spoke louder than words, suggest about management's faith (or lack of faith) in Contrave? And the company? Well, subsequent to that telltale point of the jury's decision for Contrave, the FDA sent a CRL to Orexigen to reject its drug Contrave. The stock responded by falling from $9.45 PS to around $4 PS and caused shareholders a loss of around 50% of their capital. One could argue that those transactions were initiated through the company's 10b5-1 last year in 2012. Well, it doesn't matter such transactions were initiated via the 10b5-1 for the 10b5-1 is not foolproof to abuse. The question that we need to raise is that all those transactions were sales leading up to anticipated FDA decisions. 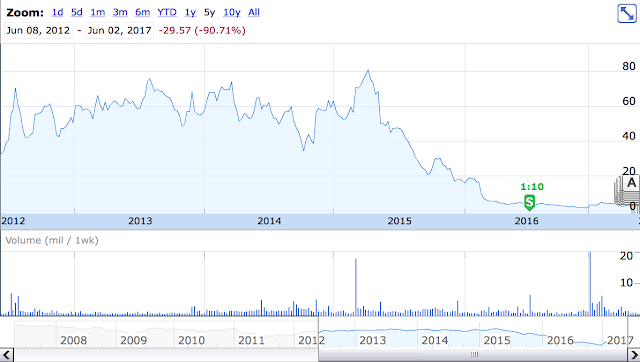 Moreover, it resembles the sales pattern leading up to the previous CRL that sent the stock into drastic declines. For Q3 FY 2013, Orexigen has $97M worth of cash and cash equivalents. The company burned $90M for FY 2012 and spent $19M this quarter alone. As Orexigen is gearing up for the FDA's verdict on approval, they will increase their rate of cash burn. The $97M will carry the company through Q3 FY 2014 at most. Orexigen's management has a history of overspending when the company is posting negative cash flow. Facing an increase in operating losses, how does the company fund increasing capital spending and increasing bonus stocks/options? As shown in the purple lines above, the management has increasingly incurred debts and issued additional shares counts. For instance, from the period of FY 2003 until now the company had increased shares outstanding by 4500%. SAN DIEGO, Dec. 6, 2013 /PRNewswire/ -- Orexigen Therapeutics, Inc. (the "Company"), a biopharmaceutical company focused on the treatment of obesity, today announced the closing of its offering of $115 million aggregate principal amount of convertible senior notes due 2020 (the "Notes"), which includes $15 million aggregate principal amount of the Notes issued in connection with the exercise by the initial purchasers of their option to purchase additional Notes in full. The Notes were offered in a private offering to qualified institutional buyers pursuant to Rule 144A under the Securities Act of 1933, as amended (the "Securities Act"). Instead of rewarding loyal shareholders, the company has been punishing shareholders by diluting shareholders value through issuing out more shares outstanding as well as incurring cumulative debt. What's Cutting Into the Increase in Capital Spending? For a biopharmaceutical company having no product approved and burning cash at the rate of $90M in the previous year, management must have believed that they deserve a pat on the back because they paid themselves $13.9M in 2011 and $7.8M in 2012. In Q3 FY 2013 alone, Orexigen burned $18M and generated the meager revenue of $860,000, given that Orexigen's market cap currently stands approximately at $600M. This company is overvalued. Similar to the company, their management is also overvalued; these insiders had been incurring excessive expenses in the form of salaries and stocks/options bonuses. For instance, CEO Michael Narachi paid himself $5.78M in 2011. Narachi used to work for Amgen (NASDAQ:AMGN) but left the job in 2004. He must be thinking that he's still working for Amgen, a much larger company ($84B cap) as he's been paying himself with very high salaries over the years. While the company's executives get paid with fat checks, Orexigen has become anorexic by burning through their cash without generating any meaningful income. How Does Orexigen's Executive Compensation Compare With Arena and Vivus? Orexigen's executive paid themselves a significant higher salary in 2011 vs. Arena (NASDAQ:ARNA) and Vivus (NASDAQ:VVUS). Given that Orexigen is a much smaller company vs. the other two, its executives were paid a comparable salary. What's bad for Orexigen's shareholders is management failed to procure an FDA approved drug. San Diego, CA -- 12/16/2013 -- An investor, who currently holds shares, filed a lawsuit against directors of Orexigen Therapeutics, Inc. over alleged breaches of fiduciary duties. Investors who are current long-term stockholder of shares of Orexigen Therapeutics, Inc., have certain options and should contact the Shareholders Foundation at mail@shareholdersfoundation.com or call +1(858) 779 - 1554. According to the complaint the plaintiff alleges that the defendants breached their fiduciary duties by awarding themselves in excess of the 1.5million annual stock options allowed. Orexigen Therapeutics, Inc. reported that its annual Total Revenue declined from $4.40 million in 2011 to $3.43 million in 2012 and that its respective Net Loss increased from $28.06 million to $90.09 million. On December 13, 2013, shares closed at $5.58 per share. Those who purchased shares of Orexigen Therapeutics, Inc. have certain options and should contact the Shareholders Foundation. With regard to the valuations metrics, Orexigen performed poorly when comparing that figure to the S&P 500. For example, the company's price/cash flow is bleeding -5.4 vs. 9.2 from the benchmark. For the trailing 12 months the company's price/book value is much higher than that of the benchmark (19.5 vs. 2.5). My thoughts on obesity and weight management is that there is no such thing as a "magic cure." The management of overweight and obese patients requires lifestyle changes including diet, exercise, and determination. Trial data showed that the Contrave does not cause robust weight reduction while having many side effects. This research illustrates that Contrave is not a good drug and is unlikely to be prescribed by physicians. Therefore, it will likely suffer from the same fate of poor sales recognition like peers Belviq and Qsymia. To make matters worse, the company's management team seems to act in its own best interest by diluting shares and incurring debts not only to fund their operation, but also to fund their own purses. With the upcoming FDA approval decision for Contrave, any bad news will imminently send the company shares into a free fall. By being a "whisper stock," OREX would tank if the market realizes Orexigen's predicament. Even in a best-case scenario, Contrave would still fail to generate meaningful sales. Hence, the future of Orexigen is bleak. There is simply too much downside and too little upside to make Orexigen a prudent investment. Author Note: we recently commenced our monthly publications of the "Best Idea of The Month" and podcast EXCLUSIVELY for premium subscribers (or "patrons") at the highly reputable company Patreon, Inc. In addition, we plan to make our research available at Seeking Alpha's Marketplace in the foreseeable future. You can subscribe to our premium services at Patreon by accessing THIS LINK.